ODS Control 10 Charger Suits ALL ODS 10 & E-Port Controllers FREE POSTAGE (Genuine Ozroll components) FREE Post. Home/HOME & GARDEN/BLINDS, AWNINGS & ROLLER SHUTTERS/OZROLL ROLLER SHUTTERS/ROLLER SHUTTER SPARE PARTS / COMPONENTS/ODS Control 10 Charger Suits ALL ODS 10 & E-Port Controller (Genuine Ozroll components). ODS Control 10 Charger Suits ALL ODS 10 & E-Port Controller (Genuine Ozroll components). Express Post Australia wide allow 2-7 business days for delivery. The old chargers (with part numbers detailed below and shown in the photo to the right) are a linear, transformer type and are now approaching 15 years in service. The charger is used to convert mains 240 V AC voltage into a lower, DC voltage that can then be used to charge the battery in the controllers. There are some signs that the old transformer style chargers are now, after 15 years, starting to fail, and this may cause problems with the controllers. 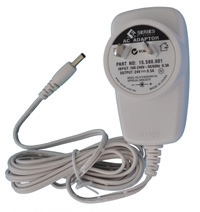 An upgrade to the new, switch mode charger (part number 15.580.003) is recommended. Customers are encouraged to stop using the old style product and upgrade to the new version. Capacitors used in the old style chargers are now starting to age and fail.This means that the charger may be putting out higher DC voltages,as well as some AC voltage, which may impact on the controller and blow the fuse in the controller.This is not a major issue, but it can be attributed to some of the failures with controllers (old and new), and it will only increase over time. The old style chargers can still work with the new controllers, but customers are encouraged to move to the new style (switch mode) chargers that are now being sold. The new chargers have a smaller, more modern design and are much more energy efficient. They are backwards compatible and a direct replacement for any of the previous OZRoll AC Adaptors. We recommend that the newer, switch mode style charger be used when they are upgrading their controllers. If they have chargers with model numbers listed above then an upgrade is recommended. The slimline design of the new charger allows much better side by side use in a power point, and uses less energy than the older version. These are all factors to encourage you to convert to using them.